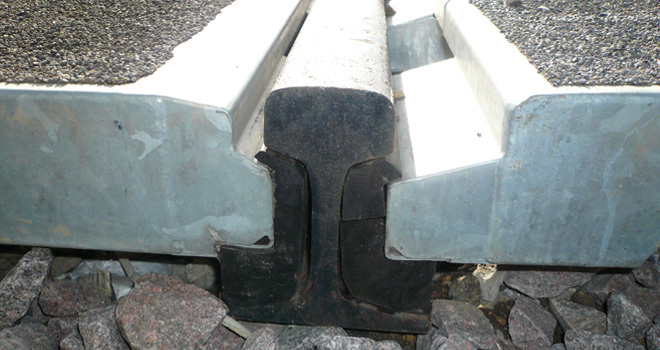 As well as ensuring a tight fit to the rail and providing shock absorption, the special rubber wedges completely insulate the steel frame of the panel, preventing short-circuiting. The short Bomac wedges of the 1970s and 1980s were awkward to fit as there were a number of different types required even for a basic crossing. They also had a tendency to work loose. Polysafe then introduced 600mm wedges that effectively wrap around the Pandrol clip. As well as giving far superior insulation and being much easier to fit, they immediately solved the working loose problem. And with a full level crossing system needing only 3 types, they are far more user friendly. When rail is updated to the high speed UIC60 rail, in the past a level crossing would have needed total renewal. However due to the Polysafe design, the modular panel system can be removed then immediately re-laid using a different type of Polysafe wedge. The cost savings in terms of materials and labour are immense. As the rubber wedges are so easy to replace they have become popular maintenance items. Many engineers choose to replace the wedges while they have the level crossing removed for maintenance. In addition we do still hold some spare rubber wedges (small type) for old style Bomac units as some of these are still in situ. If you would like further information regarding any type of rubber wedge, please contact our sales team.